Janaya Chekowski-McKenzie was born with the odds against her. On the day she arrived in 2009, she was non-responsive, and she spent a month in hospital with a lung infection. At three months, she had a seizure. Janaya needed hormone replacements to grow and doctors determined she had underdeveloped optic nerves. In spite of these early difficulties, the Beaumont, Alta., youngster has grown up to be a sassy, funny, bright girl with a lion's mane of curly-brown hair. When Janaya started complaining of worsening headaches last January, her mother, Amanda Chekowski, thought it was yet another medical hurdle to overcome. Instead, doctors told her Janaya had a rare, incurable form of brain cancer called diffuse intrinsic pontine glioma, or DIPG. Hearing the news, Chekowski and her family were stunned. They had to figure out how to explain this to an eight-year-old in terms she would understand. Initially, they made a bit of a joke of it. Janaya was told that "we found a booger in your brain that's not supposed to be there and we're going to try to shrink it," said Chekowski. The truth is very different. DIPG is a cancer that targets kids, and thus far, none have survived. But doctors around the world are trying to change that. 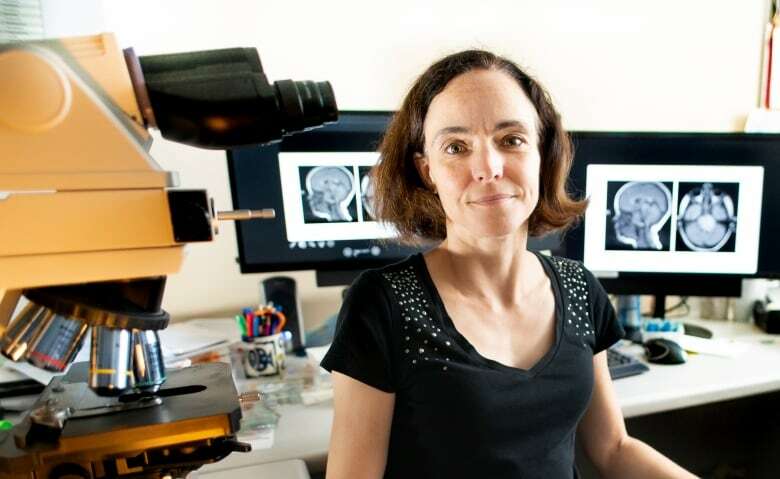 According to Dr. Cynthia Hawkins, a neuropathologist at SickKids Hospital in Toronto, about 20 to 30 children a year in Canada get this disease. 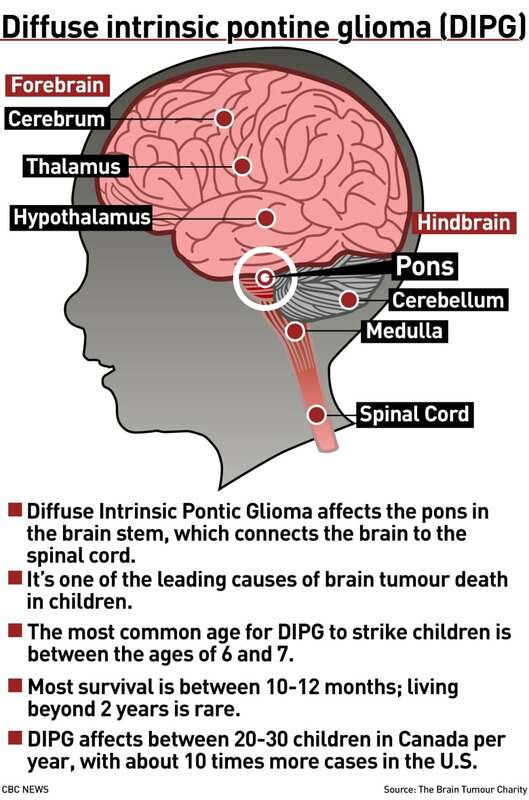 DIPG affects an area of the brain called the pons, which is in the brain stem. The stem, which is at the base of the head, connects the active part of the brain to the spinal cord. Hawkins said one of the features of this tumour is that it will move "down towards the spinal cord and up towards other parts of your brain." As it progresses, Hawkins said patients will experience symptoms similar to amyotrophic lateral sclerosis (ALS). "They'll have problems swallowing and they can eventually have problems with talking or even breathing," she said. "The thinking part of your brain is entirely preserved, so you're gradually losing the ability to use your body — and you're fully aware that that's happening." Because DIPG affects the brain stem, surgery is not an option. Doctors usually opt for a six-week round of radiation. 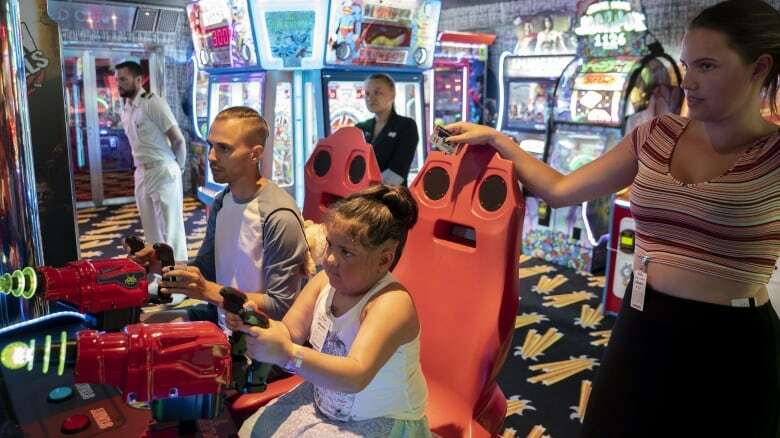 In mid-March, Janaya started treatment, but it came at a huge physical and emotional toll — the steroids used to control the brain swelling caused her to gain 40 pounds. "She didn't want anybody seeing her," said Chekowski. "She didn't want her friends to see her. She didn't want to go to school. She didn't want her picture taken." Janaya doesn't like talking too much about herself or her condition. What she will talk about is her mother, who she said "makes her laugh." Janaya also enjoys sleeping with her, "as long as she doesn't squeeze me too hard." Despite such moments of tenderness, Janaya's diagnosis and treatment sent Chekowski into a spiral. She described it as "walking through a dark tunnel with nowhere to go." By April, the radiation treatments had ended and Janaya was starting to return to her old, upbeat self. Chekowski decided it was time to start creating some memories. Back in February, when she first got the news, Janaya devised a "bucket list," which included swimming with dolphins, starting her own YouTube channel and going to the Japanese city of Aoshima, otherwise known as "Cat Island," where there are more felines than humans. With support from her friends, family and the community of Beaumont, as well as a GoFundMe campaign, Chekowski has managed to make most of the items on Janaya's list possible. "I'm going to do everything in my power to do everything [on the list], because who am I to say no at this point?" said Chekowski. "Who am I to tell her that the things she wants to do aren't doable?" For Hawkins and other researchers around the world, there have been some small steps forward in the pursuit of a cure for DIPG. Doctors are beginning to understand the genetics of this disease. Dr. Pratiti Bandopadhayay at the Dana-Farber/Boston Children's Cancer and Blood Disorders Center said it's "an exciting time" for research. "There's a lot of work underway right now. The ultimate goal is to be able to treat these kids so that they have a chance of cure with minimal side effects," she said. The next step is for doctors to build a test where they can see what drugs work best against the cells that drive these genetic changes. Some labs are starting to look at targeted chemotherapy to reach the brain stem. Others are exploring ways to boost the immune system to help it find and attack these cancer cells. But, as Hawkins said, the brain is a stubborn organ. "One of the issues around brain cancer is that drugs don't like to get into the brain. The brain's a protected area. So that's a big issue that we have to tackle as well." Currently, most of the clinical trials are for one drug type or another. Hawkins believes the best approach will eventually come from multiple drugs developed and used at the same time. She said doctors haven't been able to move the needle a lot on DIPG, but there's hope on the horizon, and that's what keeps her motivated. "Ten years ago, I would have said that it's almost impossible for the drug companies to agree to those types of trials," said Hawkins. "But that's changing and that will be a big move forward for brain cancer in general, and particularly for DIPG." Chekowski knows that Janaya will never see that day. For now, her only goal is to make her daughter happy and comfortable. When the end comes, Chekowski wants it to be painless and quick. Janaya has told her mother that she hopes that she will be reincarnated as a dolphin, wolf or bald eagle, because they are "happy, smart and free." Chekowski plans to get tattoos of each of these animals on her own body. "I've had to start thinking of what it's going to be like when she's not around," said Chekowski. "And not waking up to her every morning. And, you know, not having her when I have a really bad day — not having her to come home to."